One of the value propositions of an Internet of Things (IoT) strategy is the ability to provide insight that was previously invisible to the business. But before a business can develop a strategy for IoT, it needs a platform that meets the foundational principles of an IoT solution. Amazon Web Services (AWS) believes in some basic freedoms that are driving organizational and economic benefits of the cloud into businesses. These freedoms are why more than a million customers already use the AWS platform to support virtually any cloud workload. These freedoms are also why AWS is proving itself as the primary catalyst to any Internet of Things strategy across commercial, consumer, and industrial solutions. 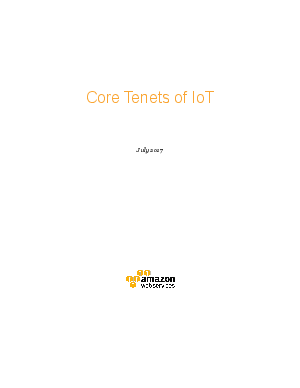 This paper outlines core tenets that should be considered when developing an IoT strategy, the benefits of AWS in that strategy and how the AWS cloud platform can be the critical component supporting those core tenets.